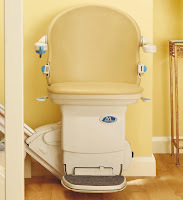 Castle Comfort Stairlifts offers top brand stairlifts, keen prices and fast installs for all those seeking stairlifts in Hull. And all work comes with our no-quibble guarantees and famous customer service satisfaction. Give us a call today on 01482 407 016 or 0800 007 6959. 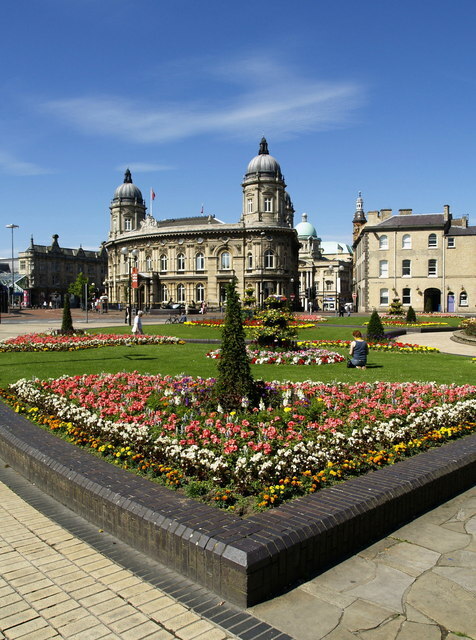 Hull is a city and local authority in the county of Yorkshire. Situated on the River Hull at its junction with the Humber estuary it started out as a market town in the Middle Ages and has been a trading hub and important port ever since then. There are over a quarter of a million people living in Hull or 'ULL as our stairlifts engineers call home! From its medieval beginnings, Hull's main trading links were with Scotland and northern Europe. Docks were opened to serve the frozen meat trade of Australia, New Zealand and South America, which is where a lot of corned beef and other tinned meat sourced their ingredients from. Spam? 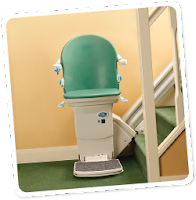 See our Stairlifts Prices Are Monstrous blogpost to find out how they're not if you know where to look.....Click to Stairlifts to read it now. Hull is also distinct in having its own local delicacy - the chip shop pattie. 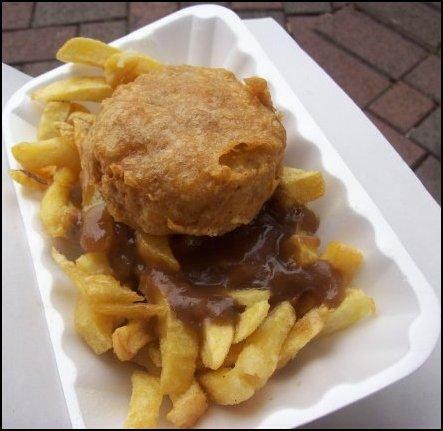 Unless you have been to Hull or the North East you may never have seen one so below just to whet your appetite is a lovely pattie, chips and gravy, tasty as owt! The city is famous for its cream coloured phone boxes which is the only place in the UK that doesn't have the red boxes that everywhere else has. This stems from having it's own council owned private phone network, which was started up at the turn of the last century. The city council eventually sold out their shares in the phone network in order to finance the building of the KC stadium, (Kingston Communications) which is the home of both Hull City Football Club known as the Tigers (pictured) and Hull Rugby League Club. There are 2 Rugby league teams in the City who are fierce rivals and it is Hull Kingston Rovers who are actually Rugby Leagues better known team, who play at Craven Park. Started in the late 18th century by a group of boilermakers it was the 1980's which has given them their most successful period so far, by winning every trophy in the game and giving them 3 visits to Wembley including the highlight of a 10-5 victory over their rivals based at the KC stadium. Although quite an industrial city in many respects with its port it has attracted many tourists and shoppers as well as it is the biggest shopping destination in the East Riding of Yorkshire. Hull makes a great family day out for young or old alike. Tourist attractions include the Medieval cobbled streets and ancient Old Town and Museum Area, through to the futuristic modern design of “The Deep”, one of the most spectacular aquariums in the world which is home to over 3,500 fish including amazing sharks and rays. The Deep is the worlds first submarium and is operated as a charity dedicated to the enjoyment and understanding of the oceans. For the elderly or disabled visitor they don't have a stair lift in this Hull destination but there are five wheelchairs available to hire free of charge (one of which is an electric wheelchair). They also have a variety of walking aids including rollaters and tri-walkers available too. Throughout the second half of the nineteenth century and leading up to the first World War, the Port of Hull played a major role in the transport of migrants from Northern Europe to Australia and America. Thousands of emigrants sailed to the city and stopped here for administrative purposes. Together with this growth in passenger shipping was the emergence of the Wilson Line of Hull. Founded in the city in 1825 by the early 20th century it was the largest privately-owned shipping company in the world. So transport has been a theme in the city being as the port was second to London at one time and a main target of German bombing raids in World War Two. If transport is a concern of yours or a loved one and you need help or assistance walking up slopes or stairs then why not be uplifted by enquiring about stairlifts in Hull from Castle Comfort Stairlifts, just call us on 01482 407016 or for free on 0800 007 6959 for a written quote. You can give us a bell from 8am to 11pm any day of the week. 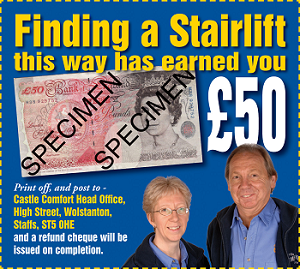 You won't get this kind of service from just any stairlift firm. A delay could cost a fall - get it sorted while its fresh in your mind. - when I retire 'll go and live there now I can get a stairlift - that bridge a bit big though. Could jump off it if it got too wet! Does Hull have its phone boxes painted cream to match all the stairlifts installed there?